For AWS Partner Network (APN) Partners helping customers migrate, manage, or deploy Microsoft Workloads to Amazon Web Services (AWS), we are introducing an Application Modernization category within the AWS Microsoft Workloads Competency, as well as the Amazon EC2 for Windows Service Delivery designation. APN Partners help customers build, deploy, scale, and manage Microsoft applications quickly, easily, more securely, and more cost-effectively. Both the AWS Competency Program and AWS Service Delivery Program have validated that APN Partners have deep technical expertise and proven customer success in the Microsoft Workloads space. Our Microsoft Workloads Partners are an essential component in delivering the full AWS value to customers. Through their investment in developing a Windows on AWS practice, we know our customers will have an exceptional experience and the most efficient deployment running Windows applications on AWS. Applications built on .NET framework are a great fit for the AWS platform. Customers start recognizing benefits just by moving applications onto AWS. From there, the benefits accelerate once the applications are modernized to integrate with and leverage AWS services and capabilities. APN Partners are a valuable asset in helping customers move and modernize their applications with minimum effort and resources. The new Application Modernization category identifies, validates, and promotes APN Partners that are highly specialized in migrating and/or building .NET-based applications on AWS. These Partners reduce the time to value for customers as they leverage their current investment and skill in .NET while modernizing applications to quickly realize the benefits of AWS. The AWS Competency Program helps customers identify and choose the best APN Partners for their AWS projects and workloads. AWS Competency Partners have demonstrated technical expertise and proven customer success through a rigorous technical validation. These are the APN Partners we recommended to customers in specialized solution areas. The Amazon EC2 for Windows Service Delivery designation highlights APN Partners that have demonstrated unique solution delivery capabilities on Amazon EC2 for Windows service. 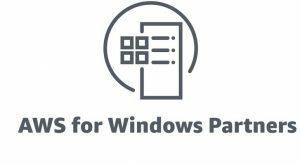 Amazon EC2 for Windows Partners improve customer experience and reduce deployment efforts for Windows-based applications by identifying the most appropriate configuration from cost, performance, security, reliability, and manageability perspectives. The AWS Service Delivery Program highlights APN Partners with expertise in delivering specific services, like Amazon EC2 for Windows. These APN Partners are showcased to AWS customers and AWS field sales teams, as well as on the AWS Partner Solutions Finder. Validated AWS Service Delivery Partners also have preferred access to private betas, roadmap briefings, and subject matter webinars.